How Hot Is Harlem This Summer? LIVE COVERAGE: Are New York’s High-Risk Neighborhoods Climate Safe? Look-Ahead: Is New York More Climate Safe? SPECIAL REPORT: Assessing Resilience Planning: Is the City Preparing Smartly for the Rising Risks of Climate Change? UPDATED: This week’s heat wave in New York, which brought the city five consecutive days of 90 degree+ temperatures from July 21-25, may have felt like it would never end. In fact, it didn’t even make the city’s top 30 longest heat waves. It fell a full week short of the record 12-day heat wave in 1953, and several days short of a string of record heat waves the city has suffered in its history. But looking ahead, indications are there’s worse to come. The NYC Panel on Climate Change reports that as the 21st century progresses, temperatures of extreme heat will become more and more frequent and the prevalence of heat waves will triple by the 2080s. 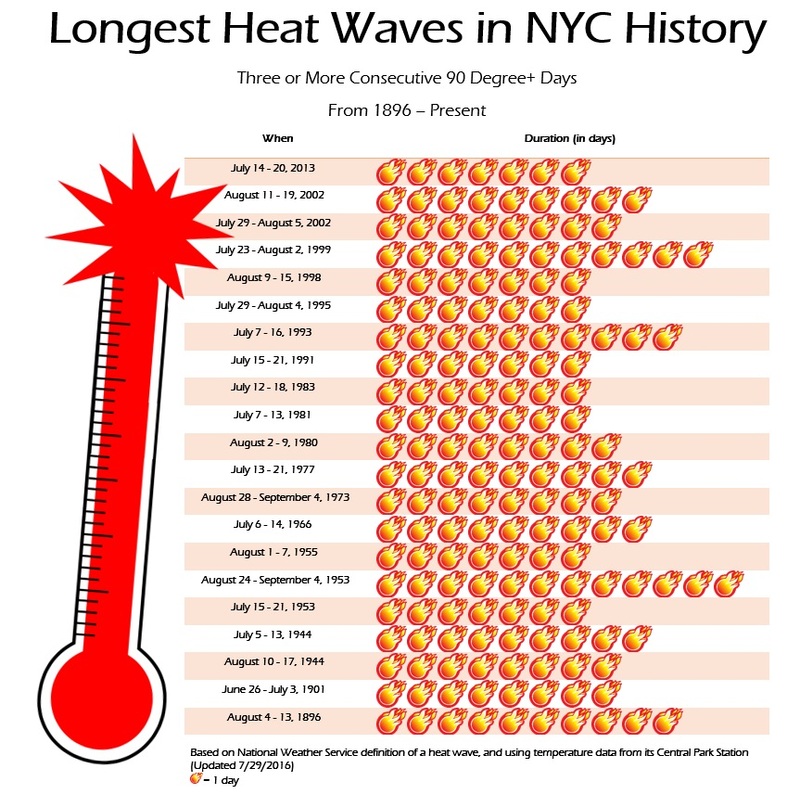 AdaptNY has compiled data from National Weather Service, based on temperatures measured at its Central Park station, for an infographic below that illustrates the longest heat waves in the city’s last century or so. We’ve also put together a quick look at some of the city’s extreme high temperature events – some hotter, some longer lasting, some more deadly, some leaving the city in darkness with power outages. July, 2013: A week-long heat wave swept across New York in mid-July, killing four elderly citizens and breaking residential power usage records. July, 2011: During several four-day long heat waves tracked by the National Weather Service, temperatures reached as high as 104 degrees, breaking records. According to the city, an estimated 31 people die of heat stroke, according to a city mortality database. July-August, 2006: National Weather Service reported a four-day heat wave, but extreme weather lasted 10 days. The New York Times also reported the the heat wave killed or contributed to the deaths of 140 people (although NYC official initially documented only 49 deaths). The overall death rate in NYC increased about 8% that summer. July – August, 2002: Two different heat waves – one lasting eight days and another lasting nine – devastated New York that summer. Exposure to excessive heat killed 17 people. July – August, 1999: This heat wave was the longest in recent memory, lasting 11 days, according to the National Weather Service. It was also the driest, with only 0.44 inches of rain for the entire month of July. Reportedly, 38 people died. August, 1998: Not only was there a week-long heat wave, but also an unprecedented streak of 35 days at 80 degrees or higher. July, 1977: The average high temperatures of this ten-day heat wave were the highest the city has ever seen – at 97.1 degrees, 13 degrees above the norm. A two-day blackout that started on the first day of the heat wave only exacerbated the effects of the heat. The high temperature on the final day reached 104 degrees. July, 1972: The New York Times reported that 891 people died during this heat wave, which the National Weather Service recorded as lasting five days. August – September, 1953: This was NYC’s longest heatwave, lasting 12 days, following another long heatwave earlier in the summer. It was also notable for how late in the summer it happened. Summer, 1936: This year featured the most severe heat waves in the modern history of the country, with 3,000 people dying and the sun scorching $1 billion in crops. According to the National Weather Service, a string of 3-day and 5-day heat waves scorched the New York City, leading to a record high of 106 degrees. June – July, 1901: The second week-long heatwave in NYC history killed more than 700 people. August, 1896: During this summer, the first 10-day heat wave killed nearly 1,500 people across New York City, many of them tenement dwellers. Posted in Extreme Weather, Harlem Heat and tagged with climate change, health, heat, heatwaves. RSS 2.0 feed.